About 1h10, 70 km by Autoroute A13, exit 14 Vernon, then N 15 towards Rouen, D 100, D 201, D 5 to Giverny. It isn't a palace or royal legend that brings travelers to this tiny village 75 kilometers northwest of Paris, on the border of the Ile-de-France and Normandy regions; what draws crowds to Giverny is the artistic legacy of Claude Monet. From 1883 until his death in 1926, Monet lived and worked in these sublime surroundings, a setting he created largely by and for himself. Giverny provided the light, the multifaceted landscape, and the meandering Seine that the painter so loved. But Monet himself supplied the grand design, as well as 40 years of unrelenting efforts to make his ravishing garden a reality. It soon became the central motif of his pictures, and in the end, his garden was the only subject that Monet chose to paint. Shortly before his death, assailed with doubts about the value of his pictures despite public acclaim for them, Monet came to regard the garden at Giverny as his ultimate creation. He employed six full-time gardeners to tend it, day in and day out. Sadly, Monet's beloved garden slowly went to seed after the painter died. 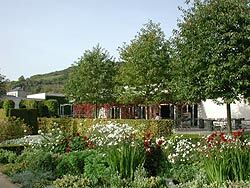 Then in 1977 the American Versailles-Giverny Foundation undertook to restore it, along with Monet's house and studio. Well before Europe recognized his genius, America had embraced Monet at his first New York show in 1889. Now, owing in large part to American generosity, Monet's admirers may visit the house where he worked and entertained fellow artist Mary Cassatt, the poet Mallarmé and many more. Nothing resembles a formal French garden less than Giverny's glorious, painterly composition of flowers, water, and greenery. Ordinary fruit trees were banished from the orchard where the flower garden now blooms; Monet replaced them with exotic Japanese strains of ornamental cherry and apple. With the arrival of spring, perennial beds lose their disciplined, linear look under an exuberance of bright blossoms. Interestingly, except for the roses and peonies, all the flowers at Giverny are humble varieties: iris, foxglove, poppies and lupine. Yet they are planted so artfully and their colors, textures, and shapes are arrayed to such advantage that an observer's eye roams over the banks and borders of the garden with as much pleasure as it does over Monet's Water Lilies, which hangs in the Orangerie in Paris. At the far end of the winding central path—take care not to trample the nasturtiums, which grow pretty much wherever they please—is the famous pond that Monet always insisted on showing off to his guests after lunch (he had paid a not-so-small fortune to have it installed). In spring, a curtain of languid wisteria nearly hides the “Japanese bridge,” which looks out over a hypnotizing profusion of water lilies. Massed on the surface of the pond, they seem to form a huge artist's palette of delicate tints: white, yellow, pink, blue and mauve. The house and three studios at Giverny—including one Monet had built specially to paint Les Nymphéas—give the haunting impression of being actually inhabited; it's as if the people who lived and worked there have only just stepped out for a moment. Everything is exactly as it was on an ordinary day at the turn of the century, from the pots and pans set out in the kitchen (Monet loved rich, complicated cooking), to the master's fascinating collection of Japanese prints. To borrow a phrase from Marcel Proust, Monet's contemporary and admirer, the evocative atmosphere of Giverny rewards the pilgrims who journey there with a sense of time recaptured.